"The rush begins as you attach yourself to the cable not knowing what it will feel like to be amongst the birds but knowing that you are safe and secure." That sentence is taken from an item on the Costa Cruises' Web site describing a shore excursion offered for cruise passengers visiting the Honduran island of Roatan, a relatively new staple on Western Caribbean itineraries. 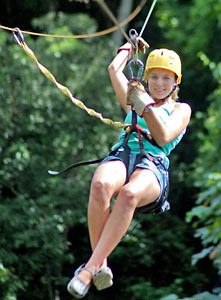 The description promises "a breathtaking rush" while flying along a zip-line on a canopy tour through Gumbalimba Park. When it was written, it was just the usual sing-song promotional statement. Reading it today, that promise of safety seems almost profane. That's because it was on that very same zip-line tour that a passenger cruising onboard NCL's Norwegian Spirit lost her life last week, falling to her death when a faulty cable snapped. The March 18 accident sent Barbara Sue Fojtasek, 44, of Texas, along with a tour guide, plummeting more than 30 feet to the forest floor below. Fojtasek was rushed to a private clinic on Roatan before being transported to a hospital in San Pedro Sula, in mainland Honduras, where she died from her injuries. The Gumbalimba Park tour guide was also treated for serious injuries, but survived and was released from the hospital on March 22. "The thoughts and prayers of the entire NCL family are with the guest's family and friends during this difficult time," Norwegian Cruise Line officials said this week in a statement, adding that the cruise line is working to assist Fojtasek's family in any way possible. Zip-line excursions have become exceedingly popular in recent years among adventurous cruisers longing for more than another day on the beach. The tours provide stunning views with amusement-park fun, and are now staples at ports from Alaska to the Dominican Republic. Preliminary details about the Roatan accident, reported by various media outlets, stated that Fojtasek's harness broke and that she fell some 65 feet. Officials at the Honduras Institute of Tourism say that neither is true. 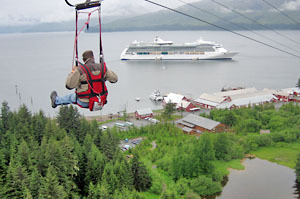 The zip-line tour consists of 13 platforms, located at the beginning and end of each of the ride's 11 separate legs, at which riders must disconnect from one stretch of cable and hook up to the next. According to a Tourism spokesman, Fojtasek and the guide were traveling down the zip-lines in tandem (joined together so that the guide could control braking, etc.) at the time of the accident. When the duo stopped at one of the platforms, the guide mistakenly did not attach them both to a security line when connecting to the next cable. When the pair resumed their ride, the primary cable snapped for unknown reasons and -- with no safety line to prevent their fall -- Fojtasek and the guide plunged 35 feet to the ground (far less than the 65 feet initially reported, but certainly high enough to be fatal). "We heard that she got stuck in the middle, and a guide came along to help her. He undid her safety clip so that he could get in front of her to taxi her along to the next platform. While this was happening, the line fell," Caitlizzle posted. "Her two kids and husband are just in shock ... all of us are. No one expected this to happen. Our families were vacationing together on the Spirit and we miss her so much." Although Caitlizzle and others on the Cruise Critic message boards theorize that the combined weight of Fojtasek and the guide may have somehow exceeded the cable's weight limit, that does not seem to be the case. According to information provided by the Institute of Tourism, the cable that failed was brand-new, only just installed in February, and had a maximum capacity of -- get this -- three tons! So, weight does not seem to have been a factor in, let alone the primary cause of, the accident. Fojtasek also does not seem to be at fault in any way. At the beginning of each tour, a visual safety presentation is given to all participants, with two guides acting out all proper procedures. There is no indication that Fojtasek failed to comply with any of the safety protocols. In short, she did everything right but lost her life anyway. Fojtasek's tragic death is the first serious incident in the Gumbalimba Park zip-line's six years of operation, and the first fatality ever to occur on any Roatan canopy tour. The accident is currently being blamed on "human error" until an official cause can be determined. Local authorities in Honduras have launched a full investigation of the accident, and the zip-line has been shut down indefinitely. The canopy tour owner is "devastated," according to the Tourism spokesman, and the operation will not resume until the investigation is complete and the owners have determined if additional safety wires need to be installed. As for the cruise lines, NCL did not respond to our questions about whether it will continue to offer the excursion, or zip-line tours like it, in the future. But a search of available Roatan excursions on the NCL Web site on Wednesday produced no listing for the Gumbalimba Park canopy tour. Carnival Cruise Lines, whose parent company Carnival Corporation owns Costa, also offers the zip-line excursion in Gumbalimba. Both versions of the canopy tour excursion offered by Carnival were still listed on its Web site on Wednesday; however, Carnival spokesman Vance Gulliksen tells us sales of the tour have been suspended until the investigation is completed. "It's the first such incident of its kind involving a cruise passenger that we are aware of, however we are very interested in understanding how it transpired and what measures will be taken to ensure it does not happen again," Gulliksen said in an e-mail response. The Gumbalimba Park canopy tour is insured by Royal Marine, a company recommended by the cruise operators who stop in Roatan, according to the Honduras Institute of Tourism. Each cruise line also approves tours offered by the park. So, where do we go from here? Is Fojtasek's death a wake-up call for all the adventure-seekers who blindly volunteer for adrenaline-pumping activities -- and for the cruise lines that endorse them? Or is this a freak accident akin to being killed by a leaping stingray? Is it one of those law-of-averages events that's bound to happen eventually, whether the activity is zip-lining through a jungle or simply crossing the street? Opinions on the Cruise Critic message boards have run the gamut, although sorrow about the accident and a newfound concern (even fear) about the prospect of dangling from a wire 30 feet above the ground seem to be universal. "I am scared now to do this!" posts member July72807. But if a sampling of the posts is any indication, most cruisers are willing to shrug off the possible implications of the accident in order to experience the high-flying fun. "Know what? It doesn't matter," opined member NCTribeFan. "I'm either going to do it, or I'm not going to do it. I'm afraid of heights and will probably freak out anyway, but I'm just not going to live my life being afraid that something bad might happen. If it happens, it happens. If not, I imagine I'll have a wonderful time." The bottom line is this: Barbara Sue Fojtasek was on a cruise vacation, expecting only to have fun. Instead, she lost her life. She didn't sign up for that. What if she was your mother? Your sister? Your daughter? Would you still think zip-lining was worth the risk -- however small? Tell us what you think.